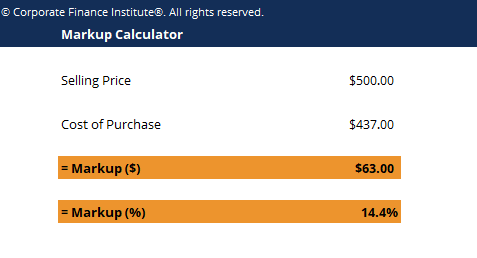 This markup calculator shows you how to compute the markup amount and percentage given the selling price and cost of purchase. The markup percentage is a concept commonly used in managerial/cost accounting work and is equal to the difference between the selling price and cost of a goodCost of Goods Sold (COGS)Cost of Goods Sold (COGS) measures the “direct cost” incurred in the production of any goods or services. It includes material cost, direct labor cost, and direct factory overheads, and is directly proportional to revenue. As revenue increases, more resources are required to produce the goods or service. COGS is often, divided by the cost of that good. Markup percentages are especially useful in calculating how much to charge for the goods/services that a company provides its consumers. A markup percentage is a number used to determine the selling price of a product in relation to the cost of actually producing the product. The number expresses a percentage above and beyond the cost to calculate the selling price. Markups are common in cost accountingProduct CostsProduct costs are costs that are incurred to create a product that is intended for sale to customers. Product costs include direct material (DM), direct labor (DL) and manufacturing overhead (MOH). Understanding the Costs in Product Costs Recall that product costs include direct material, direct labor, and, which focuses on reporting all relevant information to management to make internal decisions that better align with the company’s overall strategic goals.